North of San Antonio is a small Texas town known as Boerne (pronounced Bernie), known for its German heritage. Here, you’ll hear performances by a German band (the Boerne Village Band) and travel a Main Street called Haupstrasse. Gregg Chamberlain grew up in Boerne raising hogs, sheep and cows, and eating barbecue that reflected the area’s German roots. On a road trip driving through Utah in 1990, he decided to stay and ski and never returned to Texas. But the Lone Star State’s loss would soon became Utah’s gain. 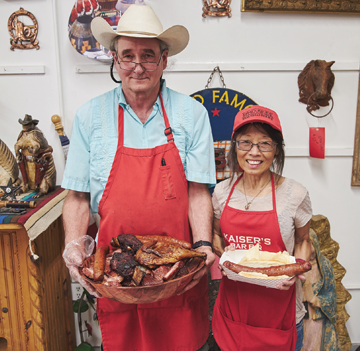 Chamberlain not only loves Texas barbecue but also swap meets, and that’s where he met Margaret Nakagiri, his work and life partner of 13 years. His mutual passions for’cue and collectibles converged when he opened Kaiser’s Texas Bar-B-Q and General Store, a former butcher shop on 300 West, now filled with pottery, rugs, wrought-iron ornaments and assorted kitsch. Kaiser is the German word for emperor, just in case the German connection hasn’t sunk in. And what emperor could resist Chamberlain’s house-made sausage that he prepares every Monday? “It takes the most time of all our meats,” he says. While most sausage is made with meat scraps left over after the premium cuts of meat are removed, Chamberlain actually uses top-quality cuts of meat for his sausage, including pork butts and beef eye of rounds. After he cuts and grinds the meat, he seasons it with garlic, ground mustard, paprika, salt and pepper. (For his spicy sausage, he adds jalapeno and cheddar). He then lets the mixture rest overnight. 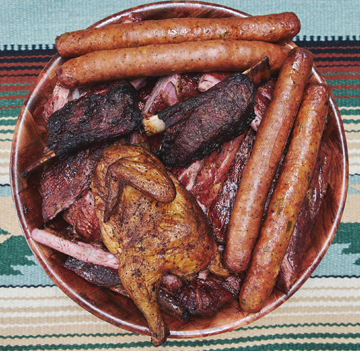 The next morning, he stuffs the meat into 10-inch casings and smokes the sausages for an hour at 200 degrees on oak wood, which, he says, imparts a sweeter flavor. 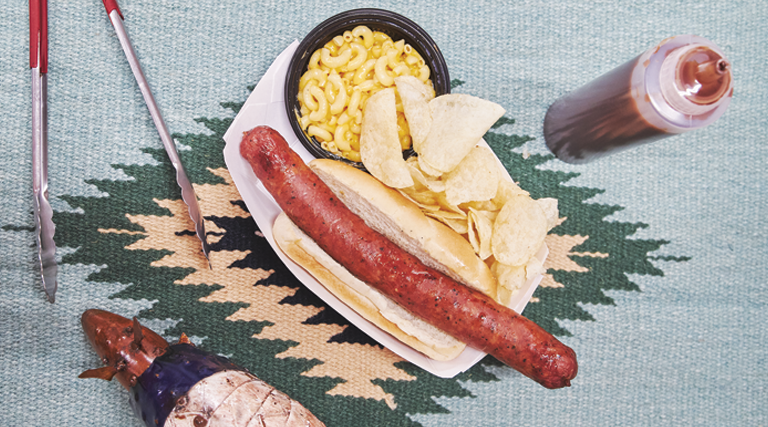 Chamberlain’s smoked sausage served on a hoagie roll runs $6.45 (and can easily be shared). For $8.49, you can order two sides to go with it. Slather with Kaiser’s BBQ sauce or mustard at will.